"What the hell are we doing back here?" 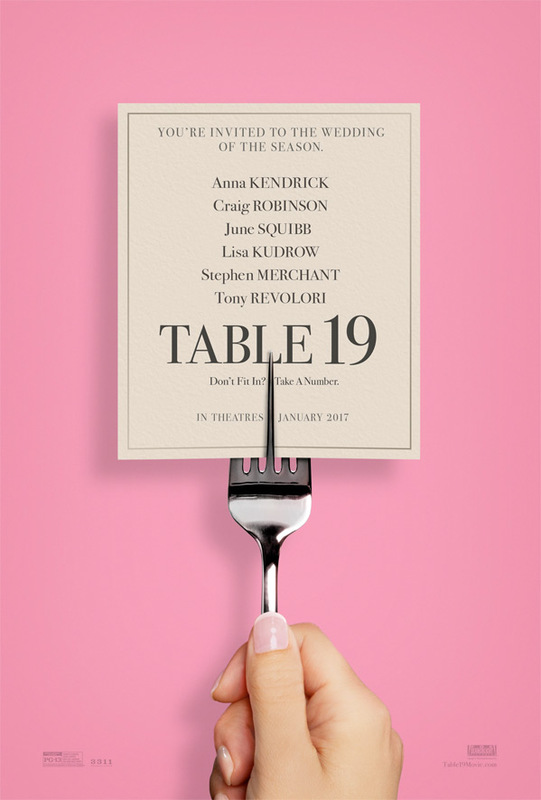 Fox Searchlight has debuted a fun trailer for the wedding comedy Table 19, from the director of Rocket Science starring Anna Kendrick as a woman who gets seated at the dread Table 19 at a wedding after being dumped by the Best Man. As cheesy as that sounds, the script is by the Duplass Brothers and it's directed by the guy who helped Kendrick first break out by casting her in the indie Rocket Science. The full cast includes Amanda Crew, Stephen Merchant, Lisa Kudrow, Wyatt Russell, Craig Robinson, Tony Revolori and June Squibb. This actually looks like it might be good. Ex-maid of honor Eloise - having been relieved of her duties after being unceremoniously dumped by the best man via text- decides to attend the wedding anyway only to find herself seated with 5 "random" guests at the dreaded Table 19. Table 19 is directed by American filmmaker Jeffrey Blitz, of the film Rocket Science and the documentaries Lucky and Spellbound previously, as well as work on "The Office". The screenplay is by fellow filmmakers/brothers Jay & Mark Duplass. The film has not yet played at any film festivals. Fox Searchlight will release Table 19 in theaters starting on January 20th, 2017 early next year. Looks great. Kendrick needs to be more popular. The Breakfast Club meets the Wedding Singer... looks forgettable. So even the fork is showing the finger... what a gross world we are living in. a rom-com with emphasis on the COM...looked pretty good! !